OK, tried a couple tasty new treats for Mother’s Day this year. 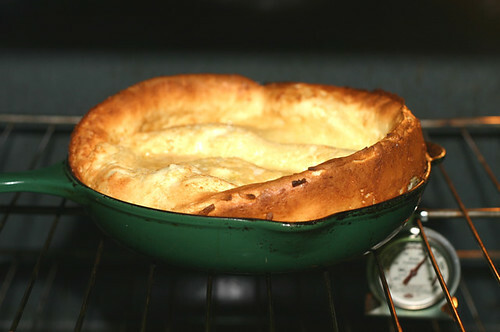 Started with the Dutch Baby, and oh baby was it good. Then we made Bacon Explosion sandwiches, I’m talking good. To finish the day off we did a prime rib on the grill. 1 1/2 cups thinly sliced fresh fruit, of choice If you’re using strawberries sprinkle with sugar 30 min before using. Fifteen minutes before baking preheat the oven to 425°. Put the butter in an 8 inch pie plate or oven-proof skillet. Place in the oven just until the butter is melted. Swirl around to coat the sides. Whisk together the milk, flour, eggs, sugar and vanilla; Slowly pour batter into hot pan; bake for 15 minutes; reduce heat to 350° and bake another 8-10 minutes, until pancake is well-browned; remove from oven and sieve confectioners’ sugar over the top; serve immediately with fruit spooned into the center of the pancake. Watch it closely when cooking and adjust times temps as needed due to size of skillet/pie plate. This looks like a great way to start a Sunday. I think I’ll try it out. Wow! This was GREAT! The subtle vanilla flavor really came through and of course the butter – you can’t go wrong with butter. 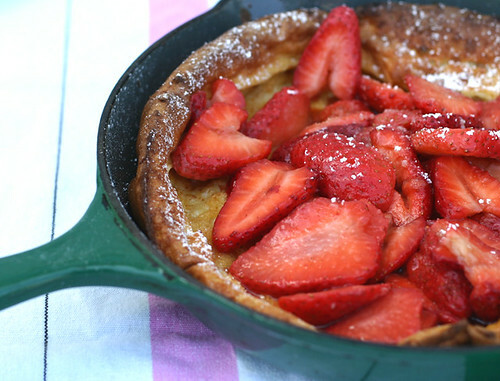 One slight addition – a drizzle of balsamic vinegar over the strawberries with the sugar. I remembered your neighbor saying that that was her favorite way to have strawberries. Remember that!? I tried this this morning when Katy came over for breakfast. It was wonderful! I used a glass pie plate, and reduced the temp by 25 degrees….as I thought you were always supposed to when using glass. No, not on this one. I should have left it at 425 degrees to get a quick rise up the pan sides. As it was I had to lengthen the time at the lower temperature. It was a bit underdone, but tasted wonderful. I had to make it twice – lucky it was EASY! First time with glass at the high temp and same issues you had. 2nd time in cast iron – that’s the way to go! As I’m Dutch I just had to check what this was. Never seen it in my live (and I’ve seen many food ;-)), but it looks delish!